Complications like anastomotic leakage (AL) after colorectal procedures are associated with significant morbidity. Subclinical AL can be misleading due to clinical behaviour and hence poses a diagnostic dilemma. Sometimes Radiological investigations are adjunct but may be detouring in diagnostic progression. We present a case of subclinical AL where near-miss in diagnosis led to unfavourable outcomes. In susceptible patients, diagnostic results need to be interpreted with caution in background of clinical scenario. Surgeons and radiologists need to be well familiarised of different presentations of postoperative complications after lower gastrointestinal surgery and their manifestations on imaging. Colo-rectal procedures comprise a major part in general surgery. In spite of all the advancements and precise surgical technique, complications, including anastomotic leak (AL), cause significant morbidity and mortality . A local or confined leakage presents without alarming symptoms hence called subclinical anastomotic leak [2,3]. Computed tomography (CT) of abdomen has become the method of choice when assessing postsurgical complications. While its superiority in such cases is beyond proven, human errors in reporting leading to substandard outcome are not uncommon. Reliance on imaging as a diagnostic tool to replace clinical judgement (due to medico-legal impact), has become an issue of concern. An 82-year-old male admitted to the medical unit for unusual lethargy. He had a Laparoscopic assisted anterior resection with a covering ileostomy for a mid rectal adenocarcinoma six weeks back. Anastomosis was performed with a 30 mm circular stapler. During current presentation, he complained of increased stoma output and unusual tiredness. The physical examination was unremarkable. Routine haematological tests showed high urea/creatinine ratio and electrolytes abnormalities. Management for volume and electrolytes’ abnormalities was initiated. Subsequently output from stoma gradually diminished and patient started to complain of abdominal pain and vomiting. Surgical team was involved at this point of care. Abdominal radiographs demonstrated dilated loops of small bowel and multiple air fluid levels. 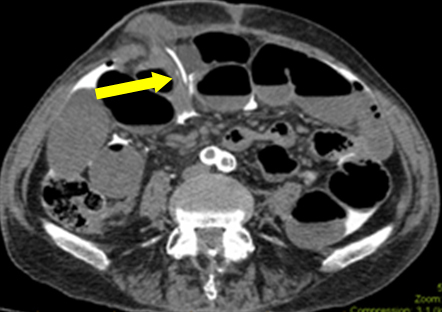 CT abdomen showed dilated small bowel loops. Colorectal anastomosis was reported intact with no evidence of leakage. Differential diagnosis was either adhesive bowel obstruction or ileus secondary to electrolyte abnormalities. Nasogastric decompression and fluid resuscitation commenced. Anticipating a delayed recovery in the background of adhesions and previous surgery, parenteral nutrition was commenced. Initially Obstructive features improved after 48hours with return of stoma function. However on reintroducing clear oral fluids, patient developed recurrent pain and bilious vomiting. Water-soluble contrast was given through Nasogastric tube (NGT) to achieve diagnostic and therapeutic results. Study reported small bowel obstruction proximal to site of ileostomy and a contrast administration through ileostomy was advised by the radiologist for confirmation. A Foley’s catheter was inserted through stoma and patient was sent to imaging department for a repeat scan. Unexpectedly report suggested extravasations of contrast in peritoneal cavity and pneumoperitoneum. A perforation at ileostomy site, perhaps due to catheter, was suggested as a possible cause. Considering ileostomy perforation, decision was made for an emergency laparotomy. As it was sixth week since primary procedure, water soluble-contrast enema was performed to check for anastomotic integrity prior to possible ileostomy resection or reversal if needed. It was reported as intact colorectal anastomosis with good rectal distension. 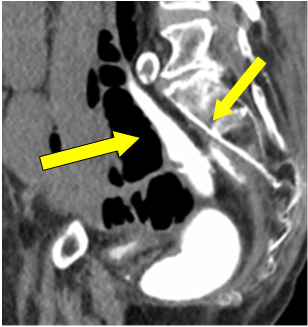 Pooling of free contrast in the pelvis was assumed as spillage from ileostomy perforation at previous instance (Figure 1 arrow). Figure 1: Contrast extravasation in pelvis. A re-look midline laparotomy was performed. Surprisingly no macroscopic perforation was visualized. Findings included moderate amount of haemoserous fluids with few fibrinous adhesions without any obstructive bands. Normal calibre, adherent small bowel loops were noticed down in the pelvis. These were not disturbed by the operating surgeon (no anastomotic leak on imaging). Adhesiolysis of remaining small bowel was done and ileostomy was reversed. Patient was transferred to high dependency unit and was closely observed. He remained stable until fifth postoperative day when became delirious and developed rapid atrial fibrillation. Laparotomy wound was noted to be in dehiscence. Given complex surgical history repeat CT scan was warranted for road map. It showed extensive pneumoperitoneum and around 200 ml rim enhancing collection in left paracolic gutter. Patient was again taken to emergency operating room where re-exploration was performed. On opening abdomen, feculent peritonitis was present with a large defect in colorectal anastomosis concealed by small bowel adhesions to the site. Anastomosis was taken down and end sigmoid stoma created with closure of rectal stump. Patient had slow convalescence and was transferred in rehabilitation facility. He finally was discharged home after spending 14 days in transitional care. AL remains the main cause of morbidity and mortality in colorectal surgery. If it is not promptly identified and appropriately treated, mortality rate can be up to 50% . A defunctioning stoma may not guarantee the integrity of lower gastrointestinal anastomosis . Different anastomotic terms and grades have been described in literature. Clinical management is dependent on anatomical site, degree of leak and severity of symptoms . Sublinical features of confined leaks often lead to confusion in diagnosis. High index of suspicion and early detection is the key to prompt clinical management. Failure to do so will result in clinical deterioration and further burden on economy of health system. CT scan is most readily available investigation for postoperative intestinal complications. Certain radiological features of leakage like peri anastomotic air, fluid or combination of both can be infrequently present . However its diagnostic efficacy in lower intestinal AL is not well established . Imaging may be confusing to interpret because of postoperative changes and other confounding factors like residual pneumoperitoneum, scarring or inflammatory stranding of pre sacral soft tissues . Size and extent of leak is another important factor to bear in mind. Contrast enema not only demonstrates rate and extent of leakage but also helps in diagnosis of phenomenon like pre sacral collections. Its role as routine study prior to diverting stoma reversal is still questionable especially in clinically unsuspected patients [8,9]. However studies have shown superiority of water-soluble contrast enema in detection of leakage in distal anastomosis where both modalities are used. Various studies have also reported false-negative rates of 35%–49% for radiologic imaging of suspected anastomotic leaks [10-12]. In challenging situations, one should rely on clinical judgment rather being directed by imaging alone as negative scan is not a definitive answer if clinical suspicion is not appropriately dealt with . In this scenario bowel obstruction was a red herring (likely ongoing ileus due to subclinical sepsis). During first exploration, no macroscopic leak was found in ileostomy. Histology of resected specimen did not show any mucosal damage. However, a serosal tear was suggestive of catheter traversing through a subserosal tract before entering the peritoneum. Retrospective analysis of images was conducted with radiology department. In one of the films, catheter’s tip was found passing through subcutaneous plane (Figure 2). This explains the free contrast into the peritoneal cavity, rather than actual ileostomy luminal perforation. Assumption about the origin of contrast contributed to the diagnosis enigma. Although trivial, but contrast leaking and pooling near anastomotic site on enema was a significant finding. Unfortunately it was attributed to the part of previous extravasations through stoma perforation. Patient had recent surgery for malignancy and because of poor nutrition and ongoing bowel obstruction, healing of anastomosis was already jeopardised. That adds to susceptibility to leak which again strengthens the need for high index of suspicion in this clinical situation. Due to previous low anterior resection, small bowels loops were adherent in pelvis confining the initially minor AL hence classical clinical feature were lacking. Once ileostomy was reversed and faecal diversion was no longer present to protect anastomotic integrity, leak size progressed and led to deterioration with peritonitis and abdominal dehiscence. Diagnostic errors can occur in any field of medicine. Caution needs to be exercised in interpreting results of studies in the background of clinical acumen . We can reduce such incidences by routine checking of scans prior to procedures and also future cases’ bank can be established by regular constructive feedback for imaging which differs with operative findings. Patients with neoplastic disease, associated with other co-morbidities and compromised nutritional status, are highly susceptible to impaired healing of a bowel anastomosis. Those should be considered vulnerable for subclinical anastomosis especially when classical signs of leakage are absent. Postoperative radiology should be cautiously interpreted in this case and surgical intervention may serve better diagnostic mode and hence therapeutic one as well. In addition, learning surgical radiology is of paramount importance for surgeons and regular feedback to radiologists may help to identify novel presentations of post operative complications after colorectal surgery. ©2016 Zainab N. This is an open-access article distributed under the terms of the Creative Commons Attribution License, which permits unrestricted use, distribution, and reproduction in any medium, provided the original author and source are credited.